New York, NY — Game Audio is one of the most technologically advanced and fastest-growing segments of the audio field. 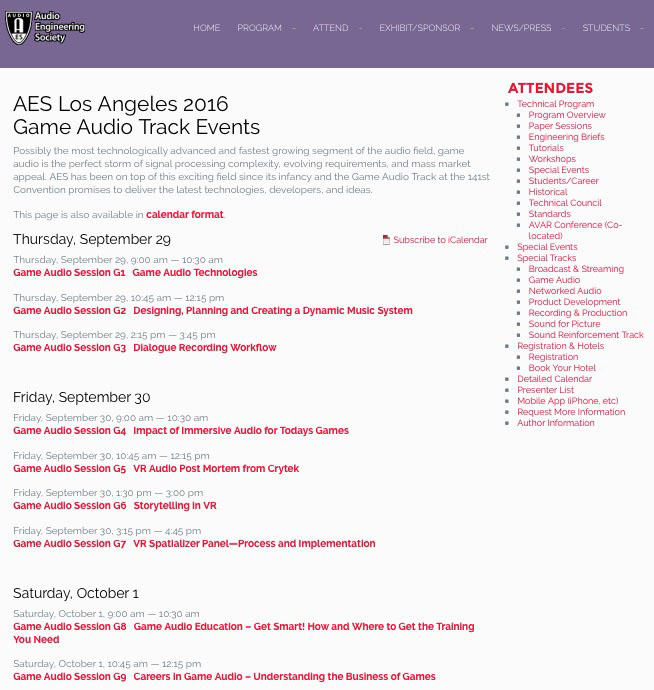 The AES Game Audio Track sessions make sure attendees are right in the middle of the action at this year’s 141st AES International Convention, at the Los Angeles Convention Center, September 29 – October 2, 2016.
AES 141st’s Game Audio Track gets out of the gate Thursday, September 29, with “Tales of Audio from the Third Dimension!,” presented by Microsoft’s Scott Selfon, which will present both a technical and creative primer on topics including dynamic simulation of position, distance, interaction with game geometry, environmental reverberation, and more. “Designing, Planning and Creating a Dynamic Music System” will follow, as Sound Librarian’s Stephan Schütze explains the complex process of creating dynamic video game music, where the music interacts with the game action to dramatically enhance the player’s experience. Thursday will conclude with “Dialogue Recording Workflow,” a look at the technical and artistic challenges of dialogue for video games, which may have as many as 10 to 100 times more spoken lines than in a movie. Friday, September 30’s “Impact of Immersive Audio for Today’s Games” will feature New Audio Technologies’ Tom Ammermann in an examination of current strategies for headphone virtualization and immersive home theater environments. Additional seminars will include a look at VR game audio design for the Sony Computer Entertainment America game Bound in the presentation “Adapting Traditional Game Audio for VR Experiences: A ‘Bound’ Post-Mortem” by Daniel Birczynski, and Steve Martz moderating “VR Audio Renderer Panel – Process and Discussion,” which will help game makers understand the spatializer rendering process and work more easily within the format. On Saturday, October 1, “Game Audio Education – Get Smart! How and Where to Get the Training You Need” will enlighten attendees on this hot topic. What are some of the latest training and degree programs? How can I start a game audio program if I’m a teacher? What about learning on your own? Moderator Scott Looney of the Academy of Art University and entrepreneurs from top educational institutions will cover these topics and more. Steve Horowitz of the Game Audio Institute and Nickelodeon Digital will lead a “Careers in Game Audio – Understanding the Business of Games” seminar, in which game studio professionals will discuss what people need to know when looking for work in the gaming industry. Furthermore, as part of the AES Los Angeles special events on Thursday, September 29, the “Implementation & Mixing for VR Games as Both Art & Science” event will gather experts from PyraMind Studios, Zero Latency VR, Technicolor, and Sony to explore both the variable aesthetics at play as well as discuss some of the latest platform, middleware and plug in developments being used to achieve realism and sonic aesthetics in today’s latest games. A newly announced AES Technical Tour to the Sony Computer Entertainment America facilities where attendees will tour their state-of-the-art audio facilities located within Santa Monica Studios, the game studio behind the hit God of War franchise. This walkthrough tour of the facilities includes an explanation of tools, process and pipeline, and samples of the studio&apos;s audio work in recent releases. Attendees will need to sign a non-disclosure agreement to enter the studio. More information on tickets for AES Technical Tours available at http://www.aes.org/events/141/gameaudio/?ID=5219. Complete AES 141st International Convention Game Audio Track events information is available on the AES website at http://www.aes.org/events/141/gameaudio/ and via the AES Events mobile app (iOS and Android), which also offers convention maps, scheduling, social media interaction, and other helpful guides to making the most of the convention.